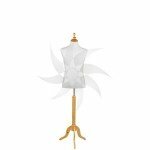 You will find a variety of busts of couture lingerie, swimwear, full, desktop or hanging. In a variety of colors and sizes. You can also find torsos polyethylene or porexpan (cork), in a variety of poses and colors, man or woman. With or without shoulders, with or without legs. We also offer a number of packs BUST + BASE + TOP unbeatable prices. As if that were not enough, on the tab of each product IMPORTANT DISCOUNTS FOR AMOUNTS buying. Here are a list of all related categories with busts and torsos, where you can find all related products that equip your trade or shop.